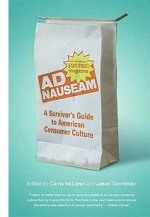 I am reading Ad Nauseam: A Survivor’s Guide to American Consumer Culture, edited by Carrie McLaren and Jason Torchinsky. The book is a funny, smart and sometimes shocking collection of articles from Stay Free Magazine and blog. I first came across Stay Free when I was researching the psychology of advertising and was impressed by their sophisticated take on how adverts affect consumers’ decision making. They discuss in Ad Nauseam how advertising is often misunderstood, with people relying on an intuitive ‘Advertising doesn’t effect me’ view or swinging to the opposite extreme of the ‘Sinister Advertisers Manipulate Consumers with their Mind Control Tricks’ position. Both positions distract from the very real, but not magical, power of advertising.